As all defense counsel, design professionals and insurance adjustors in the State of California know, the holding in Crawford v. Weather Shield Mfg., Inc. (2008) 44 Cal. 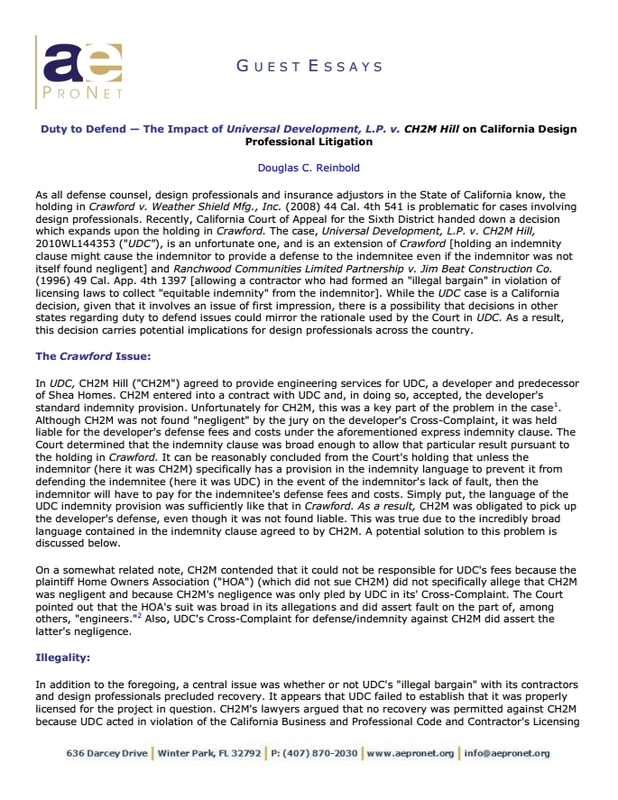 4th 541 is problematic for cases involving design professionals. Recently, California Court of Appeal for the Sixth District handed down a decision which expands upon the holding in Crawford. The case, Universal Development, L.P. v. CH2M Hill, 2010WL144353 (“UDC”), is an unfortunate one, and is an extension of Crawford [holding an indemnity clause might cause the indemnitor to provide a defense to the indemnitee even if the indemnitor was not itself found negligent] and Ranchwood Communities Limited Partnership v. Jim Beat Construction Co. (1996) 49 Cal. App. 4th 1397 [allowing a contractor who had formed an “illegal bargain” in violation of licensing laws to collect “equitable indemnity” from the indemnitor]. While the UDC case is a California decision, given that it involves an issue of first impression, there is a possibility that decisions in other states regarding duty to defend issues could mirror the rationale used by the Court in UDC. As a result, this decision carries potential implications for design professionals across the country. 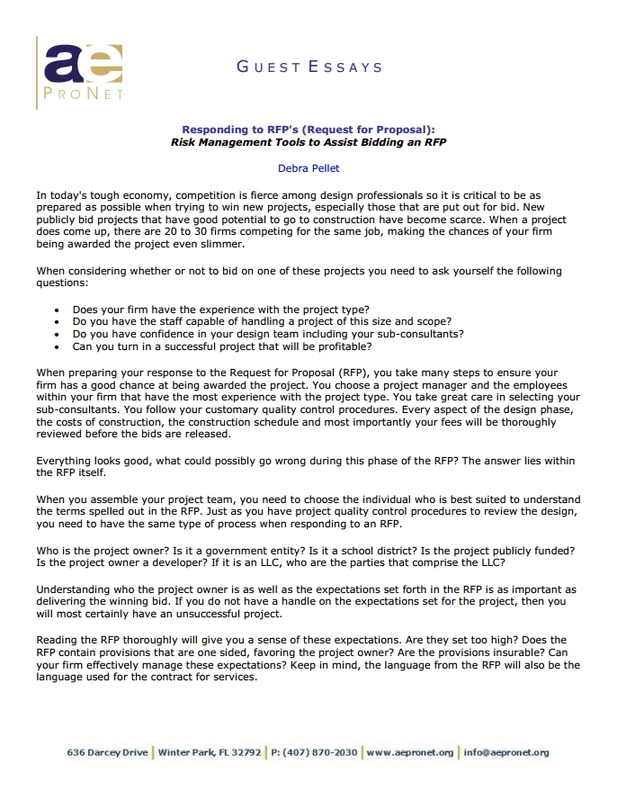 In today’s tough economy, competition is fierce among design professionals so it is critical to be as prepared as possible when trying to win new projects, especially those that are put out for bid. New publicly bid projects that have good potential to go to construction have become scarce. When a project does come up, there are 20 to 30 firms competing for the same job, making the chances of your firm being awarded the project even slimmer. Construction observation is a powerful weapon for architects and engineers (A/E) in their risk management arsenal. 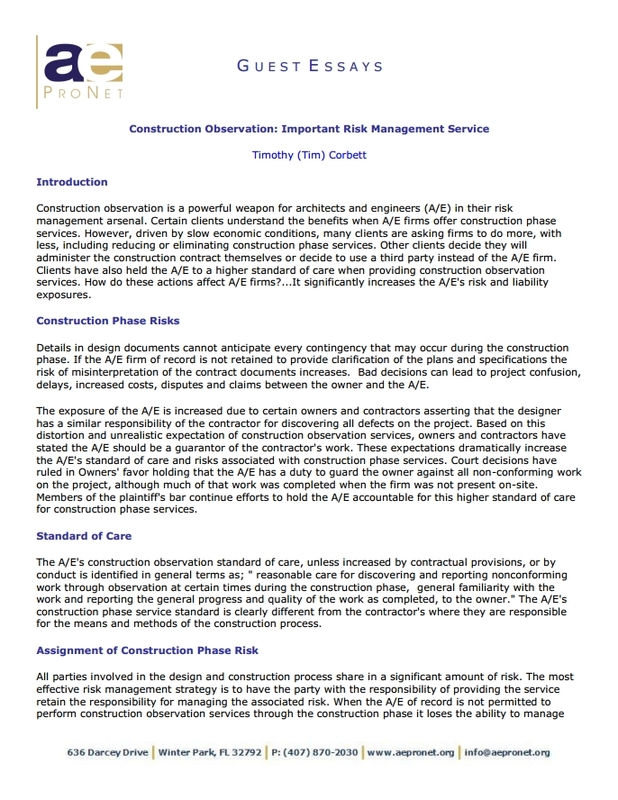 Certain clients understand the benefits when A/E firms offer construction phase services. However, driven by slow economic conditions, many clients are asking firms to do more, with less, including reducing or eliminating construction phase services. Other clients decide they will administer the construction contract themselves or decide to use a third party instead of the A/E firm. Clients have also held the A/E to a higher standard of care when providing construction observation services. How do these actions affect A/E firms?…It significantly increases the A/E’s risk and liability exposures. 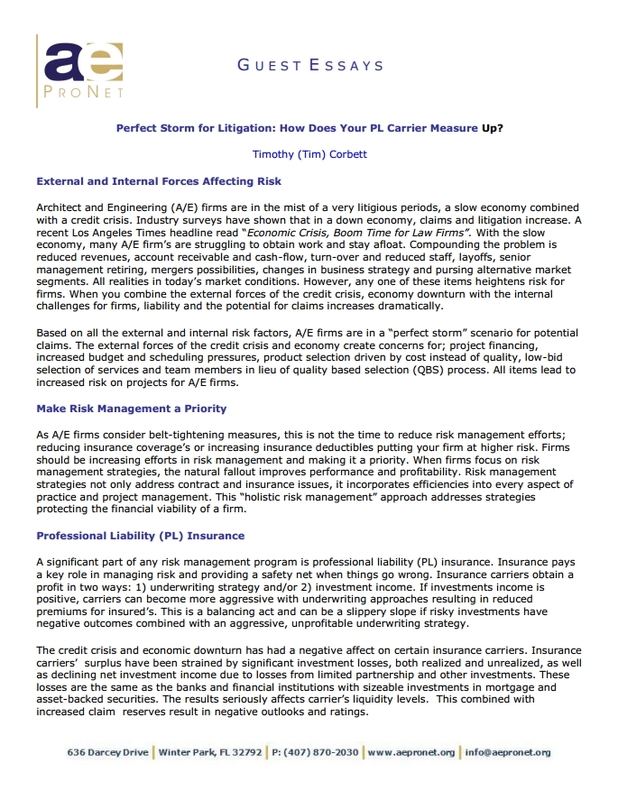 Perfect Storm for Litigation: How Does Your PL Carrier Measure Up? Architect and Engineering (A/E) firms are in the mist of a very litigious periods, a slow economy combined with a credit crisis. Industry surveys have shown that in a down economy, claims and litigation increase. A recent Los Angeles Times headline read “Economic Crisis, Boom Time for Law Firms”. With the slow economy, many A/E firm’s are struggling to obtain work and stay afloat. Compounding the problem is reduced revenues, account receivable and cash-flow, turn-over and reduced staff, layoffs, senior management retiring, mergers possibilities, changes in business strategy and pursing alternative market segments. All realities in today’s market conditions. However, any one of these items heightens risk for firms. When you combine the external forces of the credit crisis, economy downturn with the internal challenges for firms, liability and the potential for claims increases dramatically.